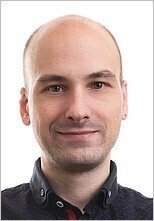 Finding the best hair loss shampoo might just be a question of trial and error. But that could take ages! And quite apart from wasting your precious time, effort and money, some products you try might even end up causing side effects or make your hair loss worse. So, use the hair loss shampoo comparison chart below. It reviews five popular shampoo products (Nisim, Nizoral, Alpecin, Nourkrin and Tricomin) and gives details on ingredients, safety, approximate cost and whether any clinical trials have shown that they actually work. These particular shampoos have been chosen because they have different types of formulation and ways in which they are said to work. So you should get a good idea as to which one might be the right type of product for you to try. 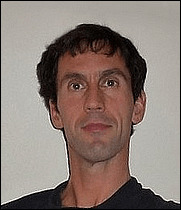 Then read the six tips beneath the chart for help finding the best hair loss shampoo for you. As well as the chart above, the six important considerations below should also help you decide which product type to try. First, decide whether you want to treat your hair loss using a DHT blocker, hair regrowth stimulator, drug or combination* of these. * You would certainly need a combination of products if you use Nizoral shampoo. That’s because it should be used only once or twice a week. So, depending upon how often you wash your hair, you would need another shampoo on the days you don’t use Nizoral. 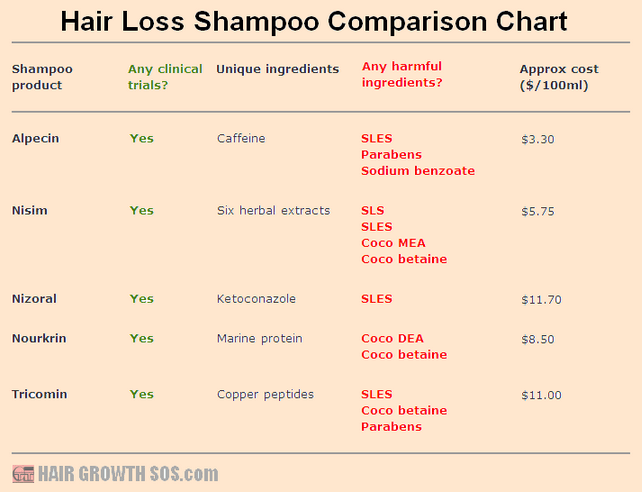 The potential problems caused by the ingredients shown in the chart were explained on the previous three shampoo review pages. So, if having read these ingredient issues, you think it's better to avoid all these products, then you need to find an organic shampoo instead. Some manufacturers conduct clinical trials to test how well their products work, and also use them as proof of efficacy to potential customers. All shampoos in the chart above were chosen because they've had successful clinical trials. So, in theory, all of them should help your hair grow. But, it’s important to note that a positive outcome in a trial doesn’t necessarily mean it’s going to be the best hair loss shampoo to use, or that it will definitely save your hair. The size of each shampoo bottle can obviously vary between products. So, the approximate cost per 100 ml has been calculated to make it easy to compare using the chart. However, clearly each product cost can also vary according to vendor, bulk orders, special offers, shipping, etc. Some products can be very expensive. So, if you’re sure you want a certain product type, but the price is a bit high, you can always look for similar products. The unique ingredients listed in the chart should make each shampoo different from any other. But, there are some exceptions. For example, Folligen has a very similar product range to Tricomin (from the chart), with both producing shampoos that contain copper peptides. Other products can seem very similar but still have some big differences. For example, Viviscal has a product range very much like Nourkrin (from the chart). But, Viviscal shampoo does not contain marine protein, whereas Nourkrin does. However, whether or not marine protein that’s been diluted with water and lathered up into foamy bubbles can really get absorbed through the skin and successfully stimulate hair regrowth, I’m not too sure. Note: Both Folligen and Viviscal have other similarities and differences from the products in the chart that they resemble. These are given below. From point #2 above - a potentially harmful ingredient contained in both Folligen and Viviscal shampoos is cocamidopropyl betaine. Folligen shampoo also contains SLS. From point #3 above – unlike the products in the chart, neither Folligen nor Viviscal shampoos have had clinical trials. However, this could simply be due to something like funding issues (clinical trials aren’t cheap). So, it doesn’t necessarily mean that their effectiveness is any worse than any similar product which has been tested. Even so, I would expect most people would still prefer a version that has been through rigorous testing and is proven to work. From point #4 above - the approximate cost per 100 ml of Folligen shampoo is $8.80 and Viviscal shampoo is $9. Some people think that, if one product costs more than another very similar product, then that must mean it’s superior. But, that's not always the case. The best hair loss shampoo is not necessarily the most expensive. Reading reviews from the official website and independent websites (like Amazon) will give some further insight into efficacy before you make your final decision. But, remember, user experience can obviously vary from person to person. So, if you read just one or two reviews about a product and they both say "best hair loss shampoo EVER! ", that's not exactly proof that it will work for you too. There are always going to be both good and bad reviews for virtually every product out there. So, clearly you need to read several reviews from various sources before you make a decision. Many people with androgenetic alopecia try to counteract the hair loss process by using DHT blockers which affect hormone balance in the scalp. 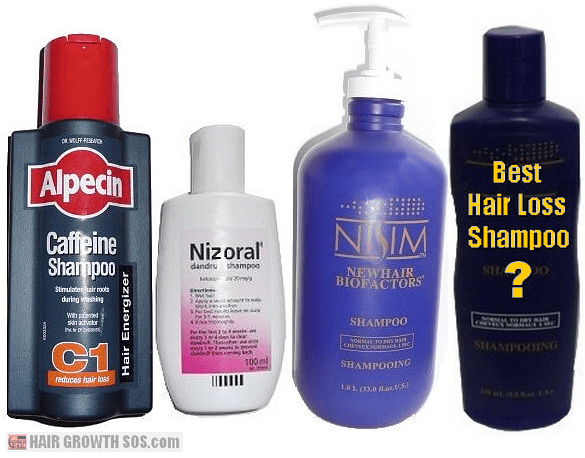 Nisim shampoo (from the chart) is just one example of many DHT blocker products available. Alpecin supplies energy – it counteracts testosterone by increasing the energy supplied to the hair follicles. Nisim is a DHT blocker – it stops 5-alpha reductase from converting testosterone into DHT. Nizoral is an anti-androgen - it binds with androgen receptors to decrease DHT availability to the hair follicles. If hair loss is a real problem for you, then trying to tackle it using a multiple approach and a variety of hair regrowth products might be a smart idea. And since you’ve got to keep your hair clean anyway, it makes sense to use a shampoo that’s also going to help... if you can find one! So, if your current shampoo isn’t helping, or contains ingredients you would prefer it didn’t, use this page as a guide to help you select a more useful shampoo for your hair loss instead. One other factor to consider is whether to go organic. Many people believe that the chemicals that form part of the ingredient list in virtually all standard shampoos is not the best way to clean your hair. And that, even though these ingredients usually represent just a tiny proportion of the total shampoo ingredients, you're better off using a simple mild, affordable organic shampoo instead. The idea being that, it will get the hair clean and might also support hair growth through any potentially beneficial ingredients it contains (as well as by not containing those referred to in point #2 above). Finally, the best hair loss shampoo for you could well be totally different from someone else. So, obviously you should not try something simply because you might have read an online review from someone who highly praises particular product they are using. This page 4 of 4. Read previous page? Nizoral shampoo.